The white grape variety comes from France. Synonyms grouped alphabetically by country are Aucerot ( Australia ); Small Heunisch, Yellow Auxerrois, White Auxerrois ( Germany ); Auxerais, Auxerrois Blanc, Auxerrois de Laquenexy, Auxois, Auzerrois Blanc, Blanc de Kienzheim, Blanc de laquenxy, Ericey de la Montée, Okseroa, Pinot Auxeris, Pinot Auxerrois, Riesling Jaune de la Moselle ( France ); Aukseroa Blan, Auxerrois Bijeli, Oinot Auxerrois, (former Yugoslavia ); Pinot Auxerrois ( Canada ). 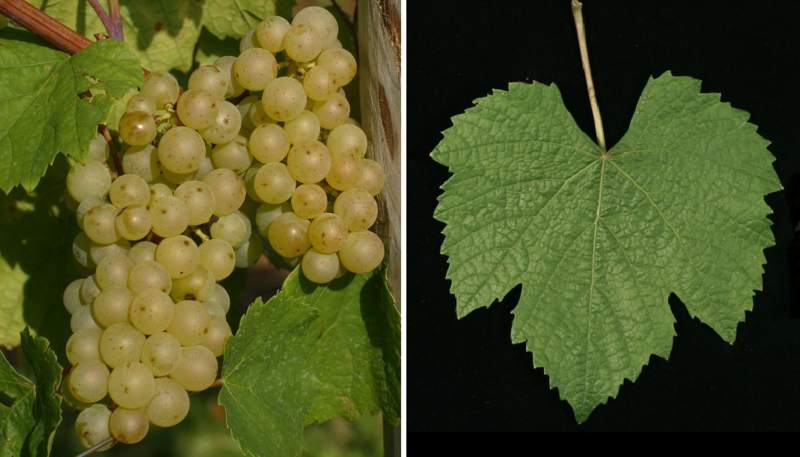 It may, despite seemingly suggestive synonyms or morphological Similarities do not match the varieties Chardonnay (Auxerrois) Melon de Bourgogne (Auxerrois Gros), Pinot Blanc (Auxerrois) or Pinot gris (Auxerrois gris). It is not a color mutation the red variety Cot (also with synonym Auxerrois). According to done in 2013 DNA analysis It is one of the numerous probably natural crosses between Gouais blanc (Heunisch) x Pinot, She was the parent of the probably natural crossing green Fränkisch, The early ripening vine is prone to fake mildew and Botrytis and especially for powdery mildew. It produces neutral, low-acid white wines with honey flavors. The variety Auxerrois was first introduced in 1816 in the Moselle region in the region Lorraine mentioned. She used to be represented in more than 30 French départements. Today she is mainly in the Alsace where it is often blended with Pinot Blanc. Furthermore, the variety is also on the Loire, in Lorraine and in law cultured. The acreage in France totals 2,365 hectares. In Germany It should first appear around 1800. There it is still used today under the name Kleiner Heunisch in the mixed vineyards of the historic vineyards. Here were a total of 190 hectares, especially in the growing areas to bathe and palatinate detected. Other stocks are also available in England (9 ha), Canada (38 ha), Luxembourg (183 ha) and South Africa, The variety occupied in 2010 a total of 2,785 hectares of vineyards (Kym Anderson ). This page was last modified at 31 March 2019 at 20:09.